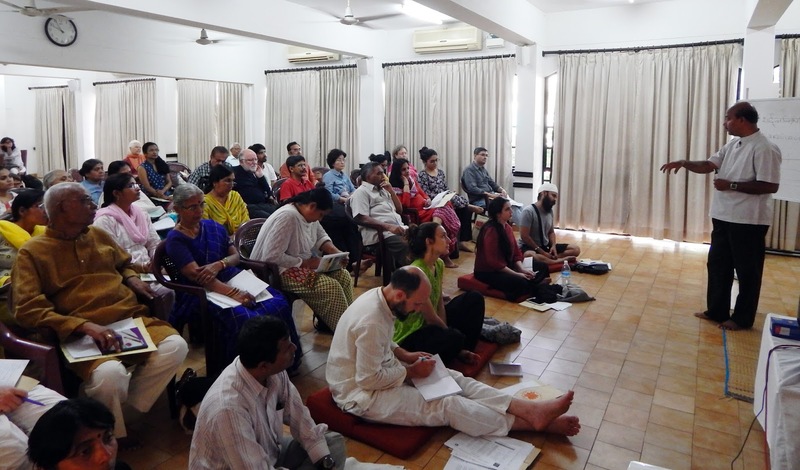 Continuing from the first day of Spandana 2016 (Intensive Sanskrit Workshop), the second day started with Mantra Yoga – a 45 minute chanting session. This was one of the striking parts of this workshop. Dr. Sampadanandaji took up Mantras from the Rig Veda, the Yajur Veda, and the devotional literature. He explained the meaning of the verses by literal translation and also explained Sri Aurobindo’s psychological interpretation of it. First things first – How to Chant? Maintain the short and the long forms – While chanting one cannot make a long short and a short long, else the meaning changes. For example, if the word is दिनमणि (DinaMani), दिनमणि = दिन (Day) + मणि (Jewel), so दिनमणि means Jewel of the day and it is a word used for the Sun. Here all the 4 syllables here are short. But while chanting, if one prolongs the short syllables then it ends up being long, we get the word दीनमणि (DiinaMani), now दीन means Poor. This changes the meaning. So, if the short gets converted to a long or a long to a short, then we will have problems, however, if long is prolonged then we won’t have any issues. Conjunct Consonants – when 2 consonants come together, then one has to apply some stress on them during articulation. For example take the word – आनन्दमयी (Anandamayi), here the conjunction – Nan has to be stressed. Anusvara – the dot above the sound which is the pure nasal sound. For example – take the word रामं (Ramam), some pronounce it as Raman and that’s incorrect. Visarga – the 2 dots besides the character. It is incorrectly pronounced by stressing the prominent ह (Ha) as in aspirated sound. For example, like in ‘aha’ or ‘ihi’. The correct pronunciation is that of a relaxing sound – Ah. One relaxes by giving the air up. Arrangement of syllables by short and long. The most important thing is that following the above, one can chant in a technically perfect manner. But, no amount of technical perfection based on the knowledge of the language, the understanding of the chandas, the phonetical correctness can make it complete, if the central element भाव (Bhava) is missing. In the absence of भाव (Bhava), the effect of chanting or prayer will not be there. भवेहि विद्यते देवः तस्माद भवोहि केवलम् means that God exists in feelings, hence in order to get the correct connect, it is only the feelings that matter and not the structure or the grammar. Finally, every mantra chant begins with the word ॐ (Om) – it is the essential sound because it is the essence of all sounds. Many definitions of ॐ exist, however, The Mother has given a very simple and a powerful definition, She says – “Om is the signature of the Lord”. Every thing in the universe has the stamp of the Divine. With ॐ we can get connected with everything in the creation. Chant ॐ and all will go well. To get the correct articulation of ॐ we need to maintain the 60-40 ratio between O-m, but again, we don’t want to go strictly by this mathematical split, instead go by the भाव (Bhava), the feel. The above verse means – ॐकारं बिंदुसंयुक्तं (Omkaram Bindusamyuktam) means Om with the dot, नित्यं (Nityam) means constantly, ध्यायंति (Dhyayanti) means contemplating, योगिनः (Yoginah) means yogis; So the sentence reads – Om with the dot, one that is constantly contemplated by the yogis. कामदं (Kamadam) means fulfill all the desires, मोक्षदं (Mokshadam) means liberation, चैव (Chaiva) means and, ॐकाराय नमो नमः (Omkaraya Namo Namah) means salutations to Om again and again. So, the complete sentence would be – fulfills all the desires and liberates, salutations to that Om again and again. In this mantra, the word शान्तिः (Shantih) is repeated 3 times. This is because the maximum chaos is at the ordinary level of consciousness – at the physical level, at the vital level and at the mental level. When शान्तिः (Shantih) is said 3 times, we are invoking peace in the physical, peace in the vital and the peace in the mental. Rest of the levels of consciousness are already peaceful, however we don’t feel that peace because of the way in which we function and work, that is, at the ordinary level of existence. The Mother says that when you begin anything, you start with this invocation – ॐ शान्तिः शान्तिः शान्तिः She further says that if you do it before and after your food, then the digestion happens properly. Again, like in every chanting, one has to feel the peace within as well, else its just a mechanical chanting – one that is devoid of feeling. Note that after the word शान्ति (Shanti) there is Visargah and we need to articulate it properly. We don’t articulate it like “Shantihi” – ending with हि (Hi) – “ihi” to be precise; instead the correct articulation would be “Shantih” – releasing or giving up the breath as if one is relaxing and blend the Visargah correctly between 2 शान्ति (Shanti) words (you can replay the above mantra). What does the word श्रद्धा (Shraddha) mean? It has ranges of meaning – faith, focus, attention, respect, devotion etc… Usually it is used for faith. Srimad BhagvadGita says – श्रद्धावान लभते ज्ञानं (Shraddhavan labhate gynanam) meaning – one who has श्रद्धा (Shraddha) can attain to knowledge. However श्रद्धा (Shraddha) is not mere faith, let us look at it deeply by starting with the de-construction of the word. Essentially, there are 2 components in the word श्रद्धा (Shraddha) = श्रत् (Shrat) + धा (Dha). धा (Dha) is a root sound, which essentially means – to hold on to, to cling to, or to grasp, to seize, to take, to place. श्रत् (Shrat) etymologically in the traditional interpretation of the Vedas is सत (Sat) and it means Truth. So, श्रद्धा (Shraddha) means holding on to Truth. Sri Aurobindo when interpreting a mantra which has got the word श्रद्धा (Shraddha) in it says – श्रद्धा (Shraddha) means whatever is true to our aspiration. Let us understand this with an example, say that – one’s central aspiration is the realization of the Divine, and each and every movement of our being must collaborate with that aspiration. If one part within our consciousness does not want to help and says – No; whereas the other part wants to participate and says – Yes, then we will be living in Divided Consciousness and this means we don’t have श्रद्धा (Shraddha). So, श्रद्धा (Shraddha) means that each and every part, each and every movement of our being comes forward to participate and collaborate with the central aspiration. In his book – The Mother, Sri Aurobindo says that if one part of the being says – Yes, while the other part has any hesitation or any shrinking or any reservation then the Truth cannot be realized. Everything and every movement of our being has to be one. So, collaboration of all the movements coming from different parts of our being need to be one with central aspiration and that is called as श्रद्धा (Shraddha). So, when Srimad BhagvadGita says – श्रद्धावान लभते ज्ञानं (Shraddhavan labhate gynanam), it is not to be interpreted as mere faith, instead, the total sincerity of the being is meant by the word श्रद्धा (Shraddha). Dr. Sampadanandaji pointed out that when one visits Sri Aurobindo’s room on your birthday, while going up the stairs, there is a message – Cling to Truth and this is the exact translation of the word श्रद्धा (Shraddha). So, every part of our being needs to cling to truth, the truth that is central to our aspiration. So the above invocation to श्रद्धा (Shraddha) was most important for the Rishis, because it was the basis of their sadhana and progress, and hence they invoked श्रद्धा (Shraddha) as a deity, as a force. प्रातर्हवामहे (Pratarhavamahe) = प्रातः (Morning) + हवामहे (we invoke), so प्रातर्हवामहे (Pratarhavamahe) means in the morning we invoke the presence of श्रद्धा (Shraddha) and मध्यंदिनं means Mid-day. So the first sentence essentially means – we invoke the presence of Shraddha Devi in the morning and throughout the mid-day. सूर्यस्य (Suryasya) means Sun and निम्रुचि (Nimruchi) means setting. Again at the Sunset, we invoke the presence of Shraddha Devi. श्रद्धे श्रद्धापयेह नः means fill us with more Shraddha and Shraddha Devi be founded in us, be seated in us, so that we can proceed on the path of progress. All of us then chanted the above mantra starting with ॐ.
Dr. Sampadanandji then took up अधरं मधुरं (Adharam Madhuram) is a part of मधुराष्टकम् (Madhurashtakam) composed by Shri Vallabhacharya, dedicated to description of Lord Krishna and created while moved by intense devotion, singing the praises of the Lord. Here Krishna’s beauty is described and he is described as मधुराधिपति (Madhuradhipati) = मधुर (Madhur) means Sweet + अधिपति (Adhipati) means Lord and so मधुराधिपति (Madhuradhipati) means Lord of sweetness. अधरं (Adharam) means lips, वदनं (Vadanam) means face, नयनं (Nayanam) means eyes, हसितं (Hasitam) means smile, हृदयं (Hridayam) means heart, गमनं (Gamanam) means gait/walk/movement. So essentially the verse means that Lord Krishna’s lips are sweet, face is sweet, the eyes are sweet, smile is sweet, heart is sweet, gait is sweet and every thing about you is sweet, O Lord of sweetness. This session was then followed by the regular classes. For the second day, we dived on to an introduction to Chandas – The Rhythm of Sanskrit Metrics, which I’ll post next. Continuing from the first post, the post lunch session (the third for the day) started with introduction to Sanskrit alphabets. Also, I would like to thank Dr. Y. N. Rao, for without his recordings, I would have not been able to fill in the gaps in my notes and write this as it stands now. Finding no satisfactory answer, the question changed to – What do we find in an alphabet? We find letters in the alphabet. This lead to another question – What is a letter? A letter represents sound, rather a letter is the smallest unit of sound. वर्णमाला (Varnamala). Literally speaking, वर्ण (Varna) represents letters and माला (Mala) means a garland. So Varnamala means garland of letters. अक्षर-समाम्नाय (Aksarasamaamnaaya) – Yet another term in Sanskrit for alphabets. अक्षर (Akshara) refers to letters and समाम्नाय (Samaamnaaya) means tradition, instruction. So अक्षर-समाम्नाय may mean the tradition of or instruction on the basic sounds of the language. Going to the root sounds आम्ना (Aamana) means to repeat, so समाम्नाय means well-repeated or mentioned together. So, composition leads to अक्षर-समाम्नाय meaning – where the basic sounds of the language are well repeated or mentioned together. But Dr. Sampadanandaji led us to the depths of why these fundamental unit of sounds were called अक्षर (Akshara) or वर्ण (Varna). The word अक्षर = अ (a) + क्षर (Kshara). The अ is negation and prefixed in front of क्षर. क्षर (Kshara) means perishable or to die. So, Akshara means Not Perishable. So, why was this property given to the sound? For this Modern Physics has its own theory and Indian Meta-Physics has its own. As per Indian Meta-Physics, the moment a स्पन्द् (Spanda) means Vibration is created, it is imperishable. The moment one thinks, one creates vibration. Once created the sound of vibration is permanent, it never dies, it does not decay, instead it gets absorbed in the आकाश (Akasha) means Space and it remains there*. So the स्पन्द् is imperishable. This realisation of the Sages and Rishis resulted the word Akshara, attributing the imperishable property of sound. It refers to the philosophy of शब्दो नित्यः (Shabdo Nityaah) means the eternity of sounds. However, the word अक्षर (Akshara) got confined to the speech sounds, the fundamental sounds of the language. Again, I would like to emphasize that, Akshara is not the gross sound that we hear, listen, spear or write, it essentially means स्पन्दन (Spandana) or vibration. * My additional note, we often find the words like Akashic Records in books, this in-turn means that Akasha is a huge repository (infinite memory) of information. Why is it called वर्णमाला (Varnamala)? There are 2 ways to look at this. वर्णमाला comes from the root sound वर्ण (Varna). Varna means to describe. Varna also means color. For example, पीतवर्ण (Pitavarna) means yellow color or रक्तवर्ण (Raktavarna) means red color. It is about looking at the sounds as color packets. This again is from the realisations of ancient rishis wherein the deeper philosophy is about the gradation of the sound. At the gross-most level, what we humans speak, is the gross sound. In order to grasp sound in its truest sense, one needs to have access to subtler levels. According to Tantric scriptures, at the subtlest level, it is called परा वाक् (Para Vak) means the Supreme Speech, that which is bright, effulgent, shining without any color. When sound descends down to become gross speech, it absorbs colors on the way. Here they saw the connection of sound with light and described it so, both at the subtlest and at the grossest levels. So, light is not free from sound and sound is not free from light. In their experience, they saw that a particular sound had a particular quality of a color and hence they associated sound with color. Also, if one looks at Sanskrit dictionary, and find out all about the root-sounds referring “to sound” – they also refer to light. One will find sound and light described together in root sound. One cannot separate sound and light. As sound was also seen associated with different colors the word Varna is used. However, Dr. Sampadanandaji pointed out that there is a problem with this definition, using this definition one cannot distinguish between all the vowels and consonants in other foreign languages. Lets say, we ask someone to speak/sing out all the alphabets of a language not known to us, how will you (not knowing that language) then be able to distinguish between vowels and consonants using the above definition? However, Sanskrit offers a specific way to differentiate them. The terminology used for vowels is अस्पृष्ट (Asprushta) means Untouched. स्पृष्ट (Sprushta) means touched and prefixing अ before स्पृष्ट negates it – so अस्पृष्ट means untouched. So, it essentially refers to the sound that is produced without touching any part of the speech producing organ. So, sound without any contact is a Vowel Sound. For example – अ (a). Whereas, consonants are called स्पृष्ट because they are produced by contact with some part of the mouth, either tongue or lips. For example – ब (Ba). Vowel sounds are free flowing sounds and one can intone it, whereas consonants are mute sounds – they cannot be intoned. Using the Sanskrit definitions – अस्पृष्ट for Vowels and स्पृष्ट for Consonants, one can distinguish between vowels and consonants in any language. Other word used for vowel is स्वर (Svara) and for consonant is the word व्यन्जन (Vyanjana) is used. Svara means स्वयम् राजते (Svayam [itself] Rajate), so स्वर (Svara) means one that shines by itself. Whereas the word व्यन्जन (Vyanjana) means Decoration. Consonantal sounds are the decorative sounds. Vowel sounds are the life of the language and the very soul of the language, therefore called आत्मा (Aatma) means soul, or प्राण (PraaNa) meaning life, whereas consonants can be compared with the body, because body can be decorated. Soul cannot be decorated. Tamil language uses this metaphor for vowels and consonants. The sounds in Sanskrit are arranged in a particular order and there is logic behind the arrangement of alphabets. You are permitted to ask the question – why this sound comes after that sounds? You have a scientific explanation which satisfies the reasoning mind. On the side 😉 – Can anyone explain the logic in the arrangement of alphabets in English language? The place of its production or pronunciation. The effort required to produce it. The duration for which it is produced. When we recite a sound, the air gets translated to sound. When air moves out through the vocal chord, it can be obstructed at different places in the mouth to produce speech sounds. However, one cannot obstruct the air at any position in the mouth where one pleases and generate a sound. There are possible positions in the mouth where the air can be obstructed. The first possible position where the air can be obstructed is from where one produces – क (Ka) ख (Kha) ग (Ga) घ (Gha) ङ (ṅa). These sounds are also referred to as Guttrals. At this position, the जिव्हा मूल (Jivha Mula) means the root of the tongue comes in contact with मृदु तालु (Mridu Taalu) means the soft palate and obstructs the air flow. It is not possible to obstruct the flow of air below this position by any human being. Therefore, क (Ka) is not only the first consonantal sound in Sanskrit, but also for the humanity. The second possible position is from where the consonants – च (ca), छ (cha), ज (ja), झ (jha), ञ (ña) are produced. At this place, the air is obstructed when the upper middle of the tongue comes in contact with the back of the hard palate. There is space between the first and second positions, however, its not possible to obstruct the air in that space. The third possible position is from where we say – ट (ṭa), ठ (ṭha), ड (ḍa), ढ (ḍha), ण (ṇa). The tongue is rolled back to touch its tip to the middle hard palate. They are also referred as Retroflexes. The fourth possible position is from where we say – त (ta), थ (tha), द (da), ध (dha), न (na). Here the tip of the tongue touches back of upper teeth when producing these consonants. They are also referred as Dentals. The fifth possible position is from where we say – प (pa), फ (pha), ब (ba), भ (bha), म (ma). Here both the lips are pressed together. They are also referred as Labials. The consonants are tabulated below summarizing the above partly (There is more to the table that we’ll see later). Refer to the figure here. I have retained the same color coding used therein. Dr. Sampadanandaji pointed out that, if anyone has the problem of Sinusitis, then just repeating these 5th group Oro-Nasal sounds for continuous period of 3 months can get rid of it. Now, if you look at any consonant row in the above table (from left to right), first you have अल्प प्राण (Alpa Prana) sound followed by महा प्राण (Maha Prana) followed by अल्प प्राण (Alpa Prana), followed by महा प्राण (Maha Prana) and finally followed by simultaneous release of air through Oral and Nasal cavities. If you very slowly and consciously repeat these sounds you will find that there is an in-built system of Pranayama in the alphabets itself. If you recite these alphabets starting from अ (a) to ह (Ha), Pranayama takes place and it begins the healing process. There is a tradition in India, where people just keep chanting these alphabets and nothing else; alphabets chanting is the mantra for them and they chant them in various ways. Next, what is the difference between the 2 pairs of sounds – क (Ka) ,ख (Kha) and ग (Ga), घ (Gha)? If you put your fingers below your chin or on your double chin, if you have one ;), then recite you क (Ka) ,ख (Kha) and then recite ग (Ga), घ (Gha). You will observe that when reciting ग (Ga), घ (Gha), the vibrations are more as compared to recitation of (Ka) ,ख (Kha). In the case of ग (Ga), घ (Gha), the vocal chord is loose and results in more vibrations. First 2 sounds of each row – क (Ka) and ख (Kha), च (ca) and छ (cha), ट (ṭa) and ठ (ṭha), त (ta) and थ (tha), प (pa) and फ (pha), there is harshness in these sounds and therefore are called कठोर or Hard Consonants whereas the rest of the consonants (except Sibilants) and Vowels are मृदु or soft in nature. In Sanskrit, there are 13 Vowels – अ (a), आ (aa), इ (i), ई (ii), ऋ (ṛ), ॠ (ṝ), लृ (ḷ), उ (u), ऊ (uu), ए (e), ऎ (ai), ओ (o), औ (au). In the table above, the duration refers to the time required to produce the vowel sound. The short form can be spoken in the same time as the time required to either blink the eye or do a छोटिका (Snap) of fingers. The long form is twice the duration of short form. ए (e), ऎ (ai), ओ (o), औ (au) are not pure vowel sounds, they are called mixed vowel sounds, because they are produced by combining basic vowels. They are called सन्ध्यक्षर् (Sandhyakshara) or diphthongs. Sandhyaksharas are always long in duration. There are 4 semi-vowel sounds – य (ya), र (ra), ल (la), व (va). इ (i) is the corresponding vowel sound of the semivowel य (ya). ऋ (ṛ or ri) is the corresponding vowel sound of the semivowel र (ra). लृ (ḷ or Lri) is the corresponding vowel sound of the semivowel ल (la). ऊ (uu) is the corresponding vowel sound of the semivowel sound व (va). These sounds are obtained by adding अ (a) to ई (ii), ऋ (ṛ), लृ (ḷ) and ऊ (uu) respectively. These are also called ईश स्पृष्ट (Isha Sprushta) means Mild Contact. Among all the vowel sounds – अ (a), इ (i), उ (u) are the Simple Vowels, having their respective long forms – आ (aa), ई (ii), ऊ (uu). ऋ (ṛ), ॠ (ṝ) and लृ (ḷ) are not pure vowel sounds there is a little mix up of consonantal sound. We studied them from the place of pronunciation above, however, the traditional way of arranging vowels is such that Pure vowels are first – अ (a), आ (aa), इ (i), ई (ii), उ (u), and ऊ (uu) followed by – ऋ (ṛ), ॠ (ṝ) and लृ (ḷ) to show visually some mix up of consonantal sound. Having finished the vowels, we will now look at what are called as Hissing Sounds. There are 3 distinct ones. Take the tongue to the respective positions and hiss from there, you will get all the 3 sounds. Sibiliants are also called as उष्म वर्ण (Ushma Varna), because they produce heat (hot air comes out) when they are articulated. Finally, the last sound is ह (Ha), is Guttral and here we have the maximum breadth release. In the tantric tradition, the entire human body is conceived as a शब्द शरीर (Shabda Sharir) शब्द means sound and शरीर means body, so शब्द शरीर means sound body. It is called so because of the flow of प्राण (Prana) means the Life-force or Life-energy through different channels or nadis (72,000 of them) in the body. The movement of the Prana generates sounds. These sounds are created in our system all the time. They are heard by the tantric sages, seers, practitioners in their meditation. That is why, in the tantric scriptures we find the location of these sounds in the human body. They gave names to these locations based on the number of energy currents. The place where 2 energy currents meet is called as सन्धि (Sandhi). The place where 3 energy currents meet is called as मर्म (Marma). There are about 52-55 मर्म स्थान (Sthana) means location in the body and each location has its own sound. In the rituals, when they do अङ्ग स्पर्श (Anga Sparsha) अङ्ग means body and स्पर्श means touch, they touch different मर्म स्थान in the body. For example, using the sound they touch the eyes or ears; doing this purifies and energises those locations. The place where more than 3 energy currents meet is called as चक्र (Chakra). This is where the sound is more obvious. Specific sounds are assigned to different chakras. When one recites those sounds or mantras, it purifies and energises that Chakra. In the tantric scriptures, when they conceived the human body as शब्द शरीर, they called an individual – अहम (Aham). अहम means it starts with अ (a) and ends with ह (Ha). So, an individual comprises of everything between अ (a) and ह (Ha), both inclusive. म (Ma) is added to make it a proper verb, hence the word अहम (Aham) means “I”. Dr. Sampadanandaji pointed out that when ह (Ha) is combined with the seven special alphabets – ण (ṇa), न (na), म (ma), य (ya), र (ra), ल (la) and व (va), then one gets a completely different experience with it when articulated correctly. If one repeats the above set for more for than 25 cycles, an individual can start sweating. This is because it makes natural कपालभाति (KapalaBhati). It is also very good for clearing the throat and other throat related problems. These 7 sounds are known as उरस्य (Urasya). उरस (Uras) means the chest and lungs, so उरस्य (Urasya) means belonging to lungs. ह (Ha) sound comes from the lowest depths, and by combining it with the 7 sounds, it further extends the depth. There are many words in Sanskrit that are उरस्य (Urasya). For example, when saying the word ब्रह्मा (Brahma), many (including me) pronounced it incorrectly as Bramha. मध्याह्न (Madhyahna) means Midday. ः – is a peculiar sound in Sanskrit. It is not to be articulated as अः (Aha) and it is incorrect. Just articulate it by release of breath like when relaxing and it will come out correctly. Visargaha means release, release of the air, or विसर्जन (Visarjana) means give it up. It is the most relaxing sound. From the Pranayama point of view, Visargaha does बाह्य कुम्भक (Bahya Kumbhaka) where one releases the air and then holds outside. बाह्य कुम्भक improves the power of concentration. One can combine Visargaha with all the Vowels and do this practice to improve concentration – अः (Aḥ), आः (Aaḥ), इः (iḥ), ईः (iiḥ), उः (uḥ), ऊः (uuḥ), एः (eḥ), ऐः (aiḥ), …and so on. अनुस्वारः (Anusvara) is the only pure nasal sound in Sanskrit. It is spoken with mouth closed and the breath is completely released from the nose. When articulated properly, it causes vibrations to start on the forehead between the two eyebrows. Why a particular sound is written in a particular form? This question led to the explanation of Devanagari Script. If you look at the whole history, from Brahmi onwards the letters were not in the pure form as you see them now. They have been worked out. At present, the symbols that we see in the Devanagari Script are the most beautiful symbols and the way we write Devanagari characters – its a pattern. To create each pattern, it needs a movement and the patterns of Devanagari symbols have a deeper connection with Universal rhythmic movement. Hence each symbol here is an auspicious symbol. Vertical Line represents the Individual. The vertical bar that we see can be on the side as in ख (Kha), the middle as in क (Ka), and ङ (ṅa) it is at the top. So the connection between the Universal and the Individual is present in the symbols. लेखफलकम् अत्र अस्ति (The writing board is here). समयसूचिका तत्र अस्ति (The clock is there). मार्जनी अत्र नास्ति (The duster is not here). मम मित्रं धवलः तत्र अस्ति (My friend Dhaval is there). द्वारम् अत्र अस्ति (The door is here). किं वातायनं तत्र अस्ति (Is the window is there?) आम वातायनं तत्र अस्ति (Yes, the window is there). अत्र सैकतं तत्र समुद्रः (The sand bank is here, the sea is there). It is important to note that there are no punctuation marks in Sanskrit. So, you will not find commas, semi-colons or question marks. The only punctuation marks in Sanskrit are । and ॥. In Prose, । represents पूर्णविराम (PurnaViram), essentially is Phrase Separator. In Poetry, ॥ represents पूर्णविराम (PurnaViram) and । represents अर्धविराम (ArdhaViram) means Half Pause. After listening to the examples, we were asked to frame our own sentences and speak it out to the class. Please note that यत्र…तत्र (Yatra…Tatra) is not to be translated to wherever…there. For wherever, Sankrit has the construct यत्र यत्र… (Yatra Yatra…). The next lesson for this session was learning about referring to near using ‘this’ and far using ‘that’ . We were introduced to the following words based on the gender that they refer to. To ask questions, we will ask according to the gender. If you don’t happen to know the gender, then you cannot say – एतत् कर्ण instead you must combine the words like this – एतत्कर्ण , and use as one single word. The basic word is एतद् (Etad). In Masculine it becomes एषः (Eshah) in Feminine it becomes एषा (Eshaa) and in Neuter it becomes एतत् (Etat). The basic word एतद् (Etad) is never used. In Sanskrit, the word base, whether it is noun or verb base, it is never used. These base words are called धातु (Dhatu) for verbal base and प्रातिपदिक (Pratipadika) for nominal base. Whereas the words which are derived from the base words by adding suffixes are called पद (Pada) means usable words or ready-to-use words. For the computer folks amongst us, in languages like Java, C++, C# – I’m reminded of the concept of abstract classes which cannot be newified, only meant to be derived from and the non-abstract derived forms can be used or newified. Dr. Sampadanandaji further answered my question – Why all the interrogative sounds in Sanskrit begin with the sound क (Ka)? Is there a logic to this? He said that to answer this, first we need to understand the nature of question? What does question do? The logic here is that, the sound क (Ka) is the first consonantal sound, it immediately is after the freely flowing vowels and क (Ka) is produced by obstructing the flow of air at the first position in the oral cavity, so it is the first obstruction. Similarly, the nature of question is to stop the free flow of thoughts and hence in Sanskrit, every question begins with the sound क (Ka). In fact, every interrogative pronouns in Sanskrit begins with क (Ka). कः (Kah), का (Kaa) and किम् (Kim) has nothing to do with near and far. They are used attributively for What, Which, Who. Before the session ended, the last lesson was about learning to count from 1 to 10 in Sanskrit. We were made to recite the numbers loud and repeat them. Dr. Sampadanandji ended the day by saying पुनर्दर्शनाय (PunarDarshanaya). The next day started with Mantra Yoga session. Yesterday I returned from Pondicherry after attending a 7 day Intensive Sanskrit Workshop at SAFIC, Sri Aurobindo Society, very fulfilled! All the sessions were excellently taught by Dr. Sampadananda Mishra, Director of SAFIC. I plan to post day-by-day learnings out of this workshop. So these are just notes that I’ve scribed during the sessions for my future reference. As a side-effect, you may benefit from it, if you are starting to learn Sanskrit. However, as I’m a beginner, there may be many mistakes or loss during translation, so be cautious. In other words, mistakes are entirely mine 🙂 At some places, there are things that I’ve added and I’ll state it explicitly. At the outset, I would also like to thank Dr. Sampadananda Mishra for taking the time out and offering to correct the posts whenever his schedule permits him. Accordingly, I’ll make corrections and improve it. He has already corrected this post. First session was Introductions, each participant explained the meaning behind their name and then Dr. Sampadananda Mishra added to it if anyone fell short of explaining theirs. This was the next session that we dived into, a sort of whirlwind introduction to the language. Dr. Sampadananda Mishra explained that each and every word in Sanskrit is conscious of its origin. Sanskrit has (and in general every language) a simple form and a complicated form. The idea in this workshop is to learn the simple form. Having said that it does not mean that Sanskrit is simplified, but its about learning simple Sanskrit, that is, by going back to its origin – the spirit and start learning it from there. Now, Lets take the word अग्नि (Agni). The Root Sound in अग्नि is अग् (Ag) – means to move up. It is describing the property of the flame to rise up when it burns. Every word in Sanskrit comes from Root Sound, which is backed by Seed Sound. For this workshop, the scope was limited to Root sounds, Seed sounds are for Advanced workshop (which will be announced later). Lets take the word अनल (Anala), अनल = न + अलम् and अलम् (Alam) means enough. The न before अलम् negates अलम् and so अनल means not अलम्, which means not enough. Fire burns up everything and yet it asks for more, which is also another property of fire. Lets take the word ज्वलनम् (Jvalanam), the root sound is ज्वल् (Jval) means to burn, which is yet another property of fire. Lets take the word शुष्मा (Susma). The root sound is शुष् (Sush) which means dry. It is the property of fire to dry things up. Thus, it describes the property of the object rather than referring to the object. Sanskrit is a Property-Based language. So, if you have a different experience with the word, you can give it a new meaning and this is exactly what अमरकोश (AmaraKosha) is. It is a online dictionary where you can add new words to it based on your experience. In Sanskrit you are allowed to ask the question – Why अग् (Ag)? Other languages will not permit this. Another important thing with synonyms is that they are not 100% substitutable by one another. Each synonym has evolved out of a property of that object. The user is left to select the appropriate synonym that brings to the fore the exact property that befits the context. With Property based languages, there is a shift in thinking towards Properties of the object rather than the object itself. So, why properties? With the focus on properties, we tend to forget about objects, because any object can possess that property. Also, it does not matter whether the object changes the form or appears in a new form and the old forms disappear, because properties are eternal. With property based languages, we can visualise a property-based universe, rather than an object-based universe. As properties are everywhere, they are universal and eternal, whereas objects are impermanent. Sanskrit always deals with that which is eternal and universal. This is why Sanskrit is an eternal language, a universal language. Lets take an example of a plough. In Sanskrit a plough is called हल (Hala). In modern times, we use a tractor whereas in ancient times it was called a plough, so the object has changed. In English, we will use different names for these different objects, but in Sanskrit you can refer to a tractor and a plough by the same name – हल (Hala). हल (Hala) is a word that describes its property/function and not the object. Now, either a single object or many objects can possess/exhibit those properties. This allows the mind to associate unrelated objects from different contexts having similar properties, however, I would say with Sanskrit, it becomes more than two properties, not just associate, but polysociate (as I would like to call it), essential for the creative energies to fire up and let one’s imagination take-off. Furthermore, we can find out the object that manifests those properties, by inspecting and de-constructing the name. Also, it would not matter whether the same property/properties is/are being fulfilled by multiple objects, we can look-up to any object that does the job. In my view, learning different languages shapes our thinking and ultimately affects our actions. With Object based languages, an object is the focal point of interaction and so my thinking naturally would tend to be object-oriented and then I’d describe object’s behaviour and properties as if the object owns it. For example, lets say, if we say that the object is a human being, then it can end up critiquing either of us. I found that Sanskrit’s signal to noise ratio is very good, that is, very high signal, less noise, thus making it very concise. Composing seed sounds to create root sounds and using root sounds to create still larger words and composing words to create still bigger words is at the base of Sanskrit. So, in Sanskrit Composition is THE way to build-up complexity and this composition is governed by rules. This to me is also simple design that we find in computer programming when designing programs. Thinking aloud (I’ve not researched or googled anything on this yet), the program we create is the universe and if we can create a programming language that allows us to express the universe in terms of properties, can we then create Sanskrit-like language to make computer programs or does it already exist? I’m wondering how would that look like? If it exists, is it Haskell? Based on whatever I’ve played with Haskell, the answer turns out be yes, but I’ve yet to use it on a real-life project to be able to confirm. Other languages like Scala, Java8, Groovy, C# span FP and Imperative Programming paradigms (slide 2). Also from computer programming perspective, composition is THE way to tackle complexity, especially in large software programs, otherwise they have a tendency to become a big ball of mud very quickly. With the ability to compose functions, we can create larger functions and there are rules of composition that we follow. Above 3 and this paragraph is added by me – just being explicit on parts that i’ve added ;). In other languages, the order of the words will change the meaning of the sentence, thus violating its integrity. Here, neither the meaning of the sentence changes, nor using the sentence changes the meaning of the context. For those computer folks amongst us, I’d say that I’m reminded of Referential Transparency that we deal in programming. In Object-oriented computer languages, we have value objects that are referentially transparent, in functional programming languages, we say that a pure function (slides 2-10) is referentially transparent. In Computer Programming, Referential Transparency is with reference to Time (which implies order), whereas in Sanskrit, it is from the perspective of Order of words. So, Sanskrit is immensely flexible while arranging the words to construct a sentence without changing its meaning. However that does not mean that there is no order at all. There are places where order needs in a sentence to be respected, else it can alter its meaning. In English language, the famous statement made by Napoleon – “Able was I ere I saw Elba”. Phonetically, whether you utter the sentence from left to right or from right to left, the sentence sounds the same and also the meaning of the sentence is not altered. This is called as a Palindrome. In Sanskrit, such a thing is called विलोम (Viloma). Viloma means reverse. In Sanskrit, you don’t just have sentences but can have ‘palindromic’ poems as well. You can check – Ramakrishna Vilomkavyam. In this if you read it from Left to Right, it is for Lord Rama and if you read it from Right to Left, it relates to Lord Krishna. There many Vilom Kavyas (विलोम काव्य) काव्य means poetry. In fact, in Sanskrit, there is Spatial Palindrome, check this post out. Now lets look at other creative uses of this language in the past. If you are aware of the Shurpankha story from Ramayana, especially the part of the story wherein her nose was cut by Lakshmana. She goes back to Ravana and conveys what all happened to her. The poet was faced with the challenge to create a verse that would physically mimic her voice quality to bring out the expression of her pain and without the nose. The poet did not use any nasal or oro-nasal sounds for the creation of the verse. Pure nasal sound (sound produced from the nasal cavity) in Sanskrit is Anusvara whereas Oro-Nasals sound (sounds produced from oral and nasal cavity) are – ङ (ṅa), ञ (ña), ण (ṇa), न (na), म (ma). Yet another example can be found is that of Niroshthya Ramayana. The creator of this observed that when a few people pronounced labial sounds: Pa – प, Pha – फ, Ba – ब, Bha – भ, Ma – म. While reciting Ramayana, they would spray saliva all over and this to the creator was disrespectful. So, the person ended up creating a version of Ramayana where the use of all labial sounds was restricted. This resulted in Ramayana, without the word राम – Rama. Initially, when Sanskrit existed, it was not even called Sanskrit, instead it was called भाषा (Bhasha). The Root sound of भाषा is भाष् (Bhash), which means to speak, later on it acquired the name Sanskrit. Also, Sanskrit is actually called संस्कृतम् (Sanskritam). The root sound is सम् (Sam), which means totality, sum, completeness, togetherness, integrity, perfectness and कृतम् (Kritam) means sculpted or created. So, संस्कृतम् (Sanskritam) essentially means sculpted to perfection. मम (Mama) means mine or belongs to me. तव (Tava) means thine or belongs to you. मम शरीरम् (Mama Shariiram) means my body. मम मुखम् (Mama Mukham) means my face. मम मुण्डम् (Mama Mundam) means my head. मम नासिका (Mama Nasikaa) means my nose. मम ग्रीवा (Mama Grivaa) means my neck. मम वक्षः (Mama Vakshah) means my chest. मम ऊदरम् (Mama Udaaram) means my stomach. मम पादः (Mama Paadah) means my leg. In the above, Neuter Gender ends with अम् (Am) as in शरीरम्, मुखम्, मुण्डम्, ऊदरम्; Feminine Gender ends with आ (Aa) as in नासिका, ग्रीवा; and Masculine Gender ends with अः (Ah) as in पादः. The word वक्षः (Vakshah) is a ‘s’ ending word in neuter gender. During this session we were asked to construct on our own other verbless sentences and speak it out loud to the class. We also learned what the 5 fingers are called in Sanskrit. कनिष्ठिका (Kanishtika) means Pinky finger. अनामिका (Anamika) means Anonymous finger. मध्यमा (Madhyama) means the Middle finger. तर्जनि (Tarjani) means the First finger and comes from the word तर्जन (Tarjan) which means to threaten. मम पिता अस्ति (Mama Pitaa Asti) means my father is present. मम माता नास्ति (Mama Mataa Naasti) means my mother is absent. नास्ति means Not Present, that is absent. नास्ति = न + अस्ति (Naasti = Na + Asti). In English न would translate to No). न is negation in Sanskrit. Use of नो (No) is also perfectly valid in Sanskrit. We then were asked to formulate questions and the next person would answer the question. An example question is – किं तव पिता अस्ति (Kim Tava Pita Asti?) means – Is your father present? Lets take yet another question – किं तव नाम धवलः (Kim tava naama Dhavalah?). In English it would translate to – Is your name, Dhaval? In response to a question having binary answer, one can respond either with affirmation or a negation. An affirmative answer – आम् मम नाम धवलः (Aam, Mama naama Dhavalah) means Yes, My name is Dhaval. मम नाम धवलः नास्ति (Mama naama Dhavalah naasti) means my name is not Dhaval. न मम नाम सम्पद् (Na Mama naama Sampad) means No, my name is Sampad. When asking a question here the order needs to be maintained, else its inappropriate and can mean something else. It means- We depart from each other to see each other again, rejoicing together again, and for receiving the shower of the Mother’s Grace again. पुनर्दर्शनाय (Punardarshanaya) means to see each other again, पुनर्हर्षणाय (Punarharshanaya) means to rejoice again, पुनर्मातृदेव्याः (Punarmatrudevyah) means from The Mother again, कृपावर्षणाय (Kripavarshanaya) means to receive the shower of Grace. Well, that’s all for now. If you enjoyed this, check out the post for Second half of this day – Wonders of Sanskrit Alphabets.